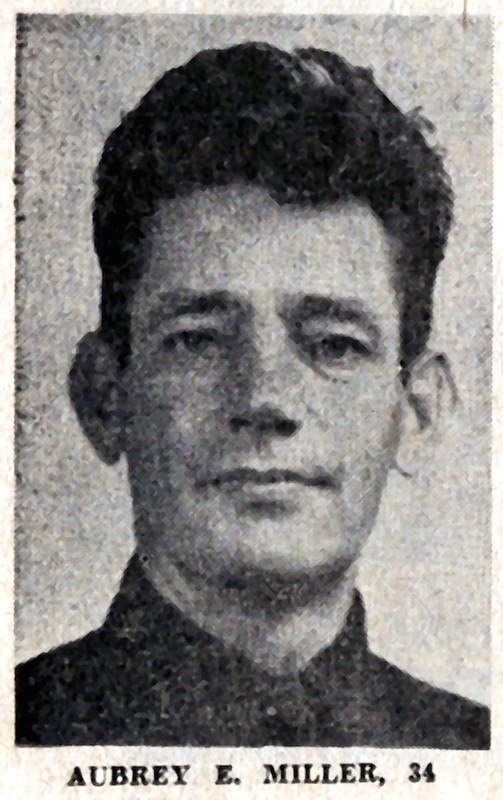 San Rafael Fireman Aubrey E. "Jack" Miller, Died in the line of duty May 21, 1950, story coming. See major fires section for more photos and documentary video. With thanks to author Diana Toci, then with San Rafael FD, and retired MCFD Firefighter Todd Lando, who was able to extract the article from an older version of software. This was originally printed in a San Rafael FD newsletter in 2008. Special thanks to the photos and information from the San Rafael FD historical collection, Larkspur Association of Volunteer Firefighters, the Nelson & Kohler families, and the Wedemeyer family for film footage from their historical collections, retired SRFD Captain John Diego, the family of Charles I. Daniels Jr., and the Marin Independent Journal for their story on May 22, 1950. Those were the words of the headline in the daily Marin Independent Journal for the Monday edition on May 22, 1950. The fire began close to lunchtime on Sunday just as the marching members of the Fire Department were supposed to participate in a downtown parade. Thousands of San Rafael residents were lining the downtown area to watch the St. Raphael’s Mission parade. Flames began to shoot high above the building with black smoke moving its way into the downtown area as the business “Mar Vista Motors” became totally engulfed, even before the firemen were able to arrive. The building was L shaped, and the crews set up their hose lines and ladders to attack the fire from the front and the back of the building. Aubrey E. Miller, 34, a World War II Veteran, married and father of four, and William Bottini, Jr. 24, also a Marin Veteran, were trapped in the fire. William was alive when the crew pulled him to safety and administered first aid. He was later transferred to Cottage Hospital [the main Marin hospital. Aubrey was trapped under a burning beam when the building collapsed, and it was believed that he died instantly. Twelve hours later, the fire claimed its second victim when William died of his injuries and San Rafael Fire Department had its first two casualties in the line of duty in 75 years. Two men employed at Mar Vista Motors were interviewed by the Police Chief, Frank Kelly and Charles I Daniels, Jr., Fire Arson Inspector. They were questioned as to whether or not they were smoking in or around the area that the fire started prior to the occurrence. The two men were Augustus Johnson, 23, Marin City, and James Thornton, 19, Woodacre. Miller and Bottini were inside the front of the building manning a hose line when the building collapsed. Robert Franzel, a young fire volunteer, was closer to the entrance of the business when the building collapsed and was able to escape uninjured. George Canessa and John Canziani pulled Miller’s body out of the building and Franzel went back in the assist Bottini. Captain Arthur Coutts, Richard Colombo (a volunteer) and George Simonds were on a ladder when the roof caved in. Johnson and Thornton had been working on Johnson’s car sanding it in preparation for painting it. They told the Arson inspector that they had been smoking up to the time of the fire but not during the fire. They said the fire started in a quart can of paint thinner sitting on one of the paint benches. “Harry (Thornton) hollered he was on fire, so I squirted the extinguisher on him” Johnson’s statement read. “I was going to pick up the five gallon can but it was stuck, Thornton said, and tipped over. Then the fire really started.” P.G.& E. lines were destroyed in the fire causing power outages throughout town for several hours. Fire Chief Clarence Johansen, estimated total damage as $75,000-or maybe more. Owners of the business, Craig Baugess, and Ed Searing, were both from San Francisco. Miller, the son of San Quentin correctional officer, Fred Miller, left his wife, Bernadette, and four children; John 11, Joanney, Dennis 6, and Barbara Kay 2. Bottini, a former bartender in his father’s tavern, was a member of a well-established San Rafael family. He was survived by his mother, Mrs. Carrie Bottini and sister, Marie Brandt. The President of the Fire Commission, Walter Castro, began a spontaneous fund drive to help support Audrey Miller’s widow and four children. By noon the next day the fund had risen to $1,000 with individuals and organizations offering help. Pledges, donations and fundraisers were offered to give his family support and relief. Charles I. Daniels, Jr’s. (San Rafael Fire Commission Chairman in 2007) recollections of the event. See the Biographies section for his life story and obituary. This particular day was supposed to be a Celebration day in San Rafael. At the time we were having a problem with someone setting off false fire alarms. Nick Gampoli and I thought because of the parade and a number of Fire Engines being dedicated to the parade that we might have issues if fire alarms were to go off so we were working downtown watching and waiting. The fire started at 4th & Lincoln, Mar Vista Motors. Smoke was billowing out into the street. Engines responded and worked the fire. I pulled up on Lincoln to the small paint and body shop about 1/3 block up 4th Street and the West side of Lincoln. Two workmen that I questioned were preparing a car for painting with a sander. They had been smoking but were not smoking at the time of the fire. A spark from their sander had apparently fallen into a can of paint thinner where the fire first ignited. In the excitement of putting out the one fire, the workman had knocked the can of paint thinner into a larger can of paint thinner, igniting both. Fire from their area moved around the building engaging the entire Mar Vista Motors building in the blaze. The fire had gained headway by the time the San Rafael Fire Department was able to begin their attack. They hooked to the 4th and Lincoln hydrant with a 2 ½” hose line the middle of which was siamesed into two 1 ½” lines. Audrey Miller (known as Jack) attacked the fire from the East side of the building. Bill Bottini took on the West side. Firefighters had a ladder against the front of the building on the East side. Chief Mat Hart and Captain Cootz climbed up to survey the damage over the roof. All of a sudden, Chief Hart and Capt. Cootz noticed the roof give way. They barely escaped by sliding their legs down the outside of the ladder to the sidewalk and safety. Jack Miller was on the right and Bill Bottini on the left side of the building when the ceiling gave way. Jack was trapped under the collapsed roof. A number of fire personnel, regular and volunteer, attempted to rescue Bill Bottini. They got him out because he was still holding on with a full grip to the hose line. He was a powerfully strong man that I had been a classmate of. We laid him on his back on 4th Street. His eyes had such a blank expression. As I looked down he looked up at me and said, 'I think I’ve had it.' Bill was taken to Cottage Hospital where he died ten or twelve hours later. When we got to Jack Miller, who happened to be Chief Mat Hart’s son in-law, he was seriously burned and we believe died instantly from the collapse of the building. It was a sad day for the San Rafael Fire Department and for everyone in the City of San Rafael. I submitted the case to the Marin County District Attorney’s office as an accidental fire. No action was taken against the two workmen working on their car when the fire started. As I recall, the only protective equipment they wore were their turn out coats and helmets. I feel because of this disastrous fire and several others that occurred around this time, that all the Fire Chiefs within Marin County were more cognizant of the origin of fires whether by natural or other causes." "When I first started, we only had one Firehouse and 15 firemen. I made $225 a month and we worked 83 hours a week. I started in 1946 and we were either on the A or B Shift. We would come in at 8 am and worked until 11 am. B would come in and relieve us one hour for lunch. Then we would come back and work until 5. B would come back and let us go to dinner. At 6 we would be back and work all night until 8 am. The B Shift would come in and we would relieve them for lunch and dinner. We had to live in San Rafael for several years before they would hire us. Most of us lived either in Bret Harte or Sun Valley. You could never leave town and if you had to leave town, you had to get someone to relieve you. We had house gongs (6 inch bells) any alarm in town would set off or someone at the Firehouse could press a button and set all our home bells off. We would respond to all and any fires - even on our days off. We got a call for a fire from fire boxes. There were no Dispatchers and our Fire Secretary worked out of City Hall. We had a whistle that was in operation that rang 8 am, noon, and 5 pm daily that you could hear all over the City when it went off - people set their watches to it. The day of the fire I was the driver on Engine 1 - we had three engines all together at that time. Bill Bottini and Jack Miller rode on the back - the guys stood on the back and held on, back then. I stopped at the first hydrant outside Joe’s and 4th and ran my first hose line that Jack and Bill took in the front door. Then I went down to the second hydrant on 5th and Lincoln and ran the second hose line. I am not sure who was on that line. Then I came around and ran a third line that I was on. I came up the alley. I don’t remember the roof coming in, but it seemed like I was in that position for hours. Chief Hart (Jack’s father–in–law) was working the fire and he came up to me and said, 'We lost your buddy.' That was the first I heard of it. I never saw him or anything. Father O’Meara was there and I asked him if they were alive and he said, 'Yes.' He didn’t want to tell me but I was pretty sure that they were dead. This was an automotive place where they were getting a vehicle ready. They had a gallon of volatile liquid - I am not sure what it was. It spilled and started the whole fire. Jack and Bill went in the front door. I don’t think the roof was secured that well - that’s what trapped them. Fred Shuer was the Fire Chief and the first paid Chief in San Rafael. Chief Castro was there as a volunteer. These two were my closest friends that died that day. I had nightmares for two years after that. Jack and I started doing fire alarms together. I ran six bare cables to all the stations that were built later plus the fire alarms. Jack’s wife and my wife were close friends. I was pall bearer at both funerals. They both took place at St. Raphael’s. People and school kids were lined up all the way down Fifth Street to Lincoln on both sides. The Mayor, Commissioners, and Fire Department members from all over the County were there. A Special Marching Unit from San Francisco Fire Department was there as well as all the members of the San Rafael Police Department. We were very close to the Police Department in those days - I know you guys still are. When I started we had 22 Fire Alarm boxes. When I retired we had 100 boxes. When East San Rafael was underwritten they told the Fire Department had to increase the alarm boxes. Five boxes were pulled the day of the Fire. I was glad I had worked on placing them there."